Weird Beard Brew Company, a London based brewery who specialise in hand-crafted beers came to Bell Flow looking for a flow meter to use in their brewery. The requirement was for a high accuracy meter, with minimal wear and tear to ensure longevity and minimal maintenance, allowing more time to make delicious beer! 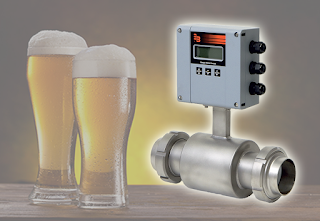 The Badger Meter MIDF Hygienic electromagnetic flow meter was chosen and was to be used with both beer and water in the process, so it needed to be hygienic and have sanitary fittings. In this case, tri-clamp connections as these were already in place throughout the brewery, so this would allow easy installation with minimal interference and would allow the meter to be easily removed and put into a different line if needed. The hygienic mag meter features a food safe PTFE liner, 304 stainless steel body, and tri-clamp connections. The tri-clamp connections enables the meter to be easily removed from one line and put into various points within the process to measure water going into a vessel and beer out of another. In addition, this meter has an accuracy of ±0.25% and no moving parts, allowing it to prevent wear and tear that traditional styles of meters often have. Coupled with the M2000 LCD amplifier, this also gives pulse and 4-20mA outputs which can be used for monitoring and batch control and provides a high performance for all conductive fluid applications. The backlit LCD screen shows actual flow rate with 2 totalisers and status. For more information on the MIDF mag meter, please contact us at sales@bellflowsystems.co.uk or 0800 027 7786.